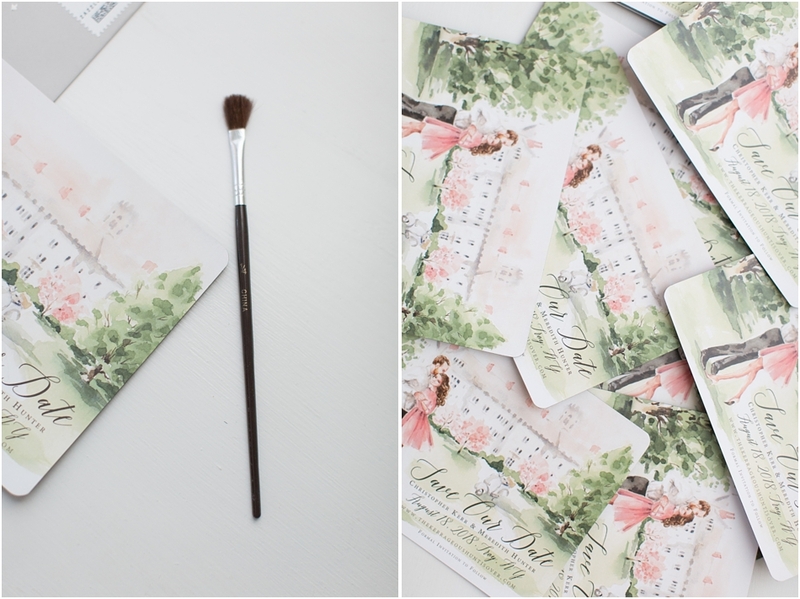 It's time for our second installation of the step by step series of our wedding planning! Let me start by saying I know it's completely odd that we didn't use our engagement photos for our Save the Date, being wedding photographers and all, but that is for a couple of reasons. 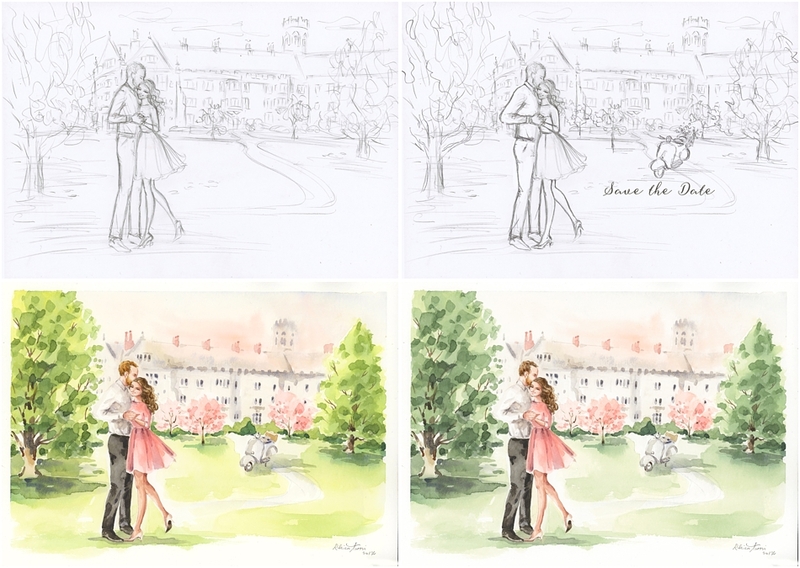 One was because I have always been OBSESSED with watercolor art and had been dying to incorporate it into our wedding since the day Chris got down on one knee (ok maybe before that actually). The second was because I love cherry blossoms and spring and since our wedding can't be in the spring, I was pretty insistent that our engagement photos be in the spring. In order to get them out 8-10 months before the wedding, there was no way we could wait for our session. We started by finding our favorite artist on Etsy. What was important to me was knowing what I was going to get, so I looked for a consistent artist. (I also recommend this for picking your wedding photographer by the way!). Next I reached out to Rhian because I just LOVED everything she put out there. She started with a questionnaire and then gave us our first sketch. From there we went around with her a few times to make tweaks and adjustments and wound up with the watercolor art of my DREAMS! Next I ordered our final design from CatPrint because I asked for referrals from my favorite invitation designers and this one kept coming up. It was very important to me to have accurate coloring since I was so particular about the coloring in the first place! We decided to go with magnets because I know that I have a much easier time keeping track of the Save the Dates I receive that are magnets. We thought potentially doing a card and including a magnet would work, but I have heard horror stories that they accidentally were put through the machine. 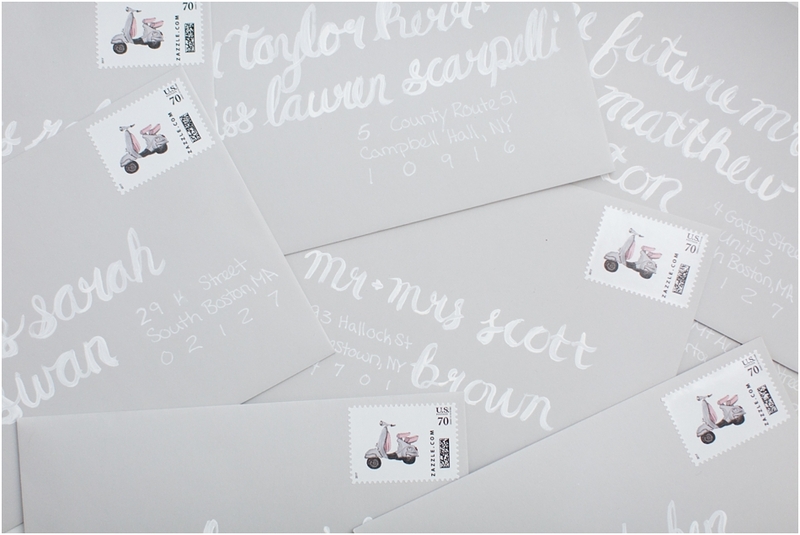 About the same time as ordering the magnets, I ordered our custom stamps from Zazzle. 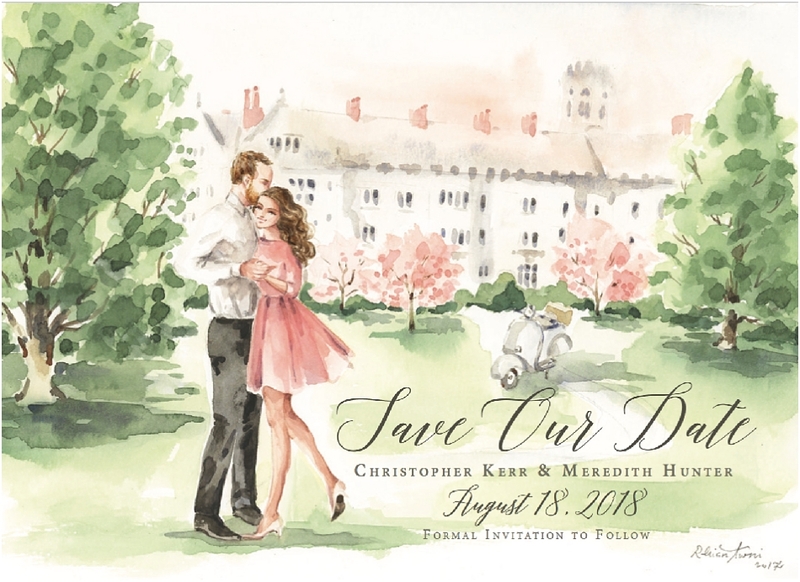 I looked at some already designed "Save the Date" stamps, but both Chris and I felt that would be redundant and so we went with a moped drawn by my mother (because of our first date!). Keep in mind that magnets weigh more so you may need higher priced postage! 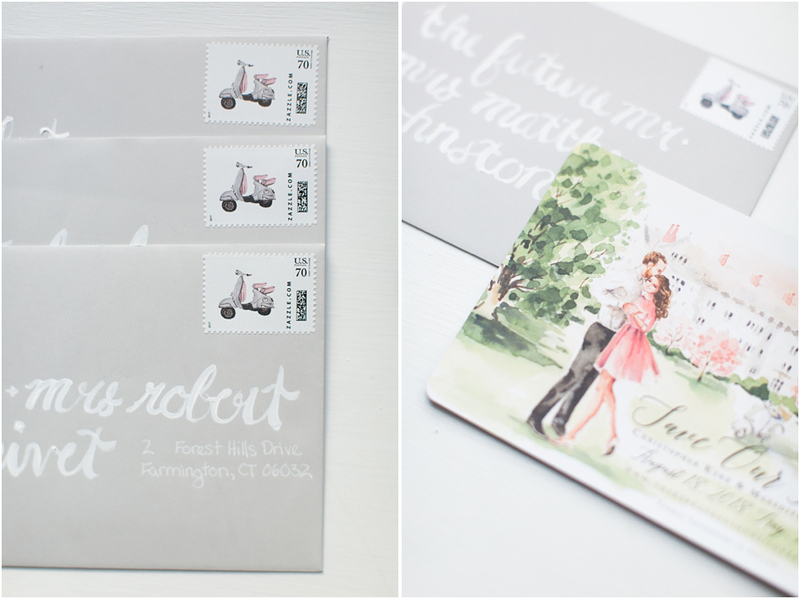 Ours came to $0.70 per envelope. Finally (and I do NOT recommend this) I told myself I could calligraph the envelopes myself. Three trips in two days to Michaels later, I sat down for 11 hours straight (not an exaggeration) and I finished painting and addressing the envelopes. 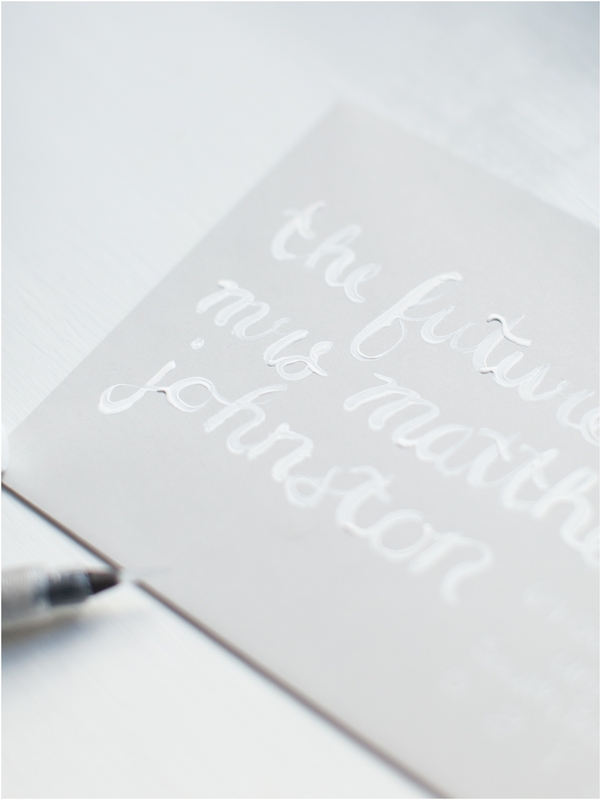 If I was doing this again, I'd hire a calligrapher but I loved how they turned out with that hand drawn raised feeling I wanted! That's it! I am absolutely thrilled with the final result.